Warning! This method is froudfree and will only help you more in case you decide to operate a mobile money transfer business in Kenya with both M-Pesa and AirtelMoney. 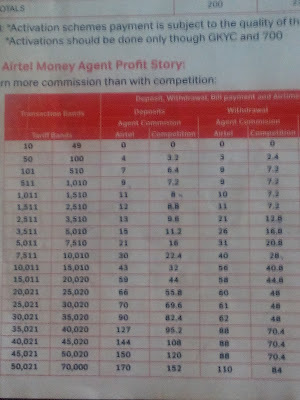 In fact, this can be a money doubling boost to the existing M-pesa/airtelMoney businesses in case you are in mobile money transfer agency business and wondering how you can earn more Mpesa/Airtel money agent commissions each month. Otherwise, you can as well try it at your own risk in the comfort of your home, with little cash investment. 1. Two or more Safaricom lines/SIM cards registerered for M-Pesa. 4. Fully functional Airtel money agent till line. Probably, you already have most of the requirements listed above and all you need now is the METHOD to put them all to work. Do you now understand why I insisted earlier on better trying this mobile money transfer business trick on an existing business? Practically, we will be focusing on steps on how you can actually make more M-Pesa/AirtelMoney agent commission money by twisting the working systems of both Airtel money and Safaricom M-Pesa using a very simple trick- which is very much legal and easy to follow. To clarify a bit more, we are merely devising a way to deviate from the usual reliance on M-Pesa or Airtel Money customers as agents to earn commission. Instead, you will be in control of everything and earn commissions as your own customer. Assuming you already have everything set in place as listed, we will start by loading the 10k cash as agent float to M-Pesa and Airtel Money tills respectively. From this point, you will be depositing Ksh.110 cash to each of your 4 registered lines 3 times daily for the rest of the month. That is; morning, noon and the evening. You will be using M-pesa till to deposit to 2 Safaricom SIM cards and the Airtelmoney till to Airtel lines respectively. At this rate, the transactions will not be flagged as split deposits. Now let’s do a quick math to clarify the facts we are looking to accomplish in this simple Mpesa commission trick. With your 3 daily transactions of 110 bob to each of 4 registered SIM cards for the rest of the month, this will guarantee you a total of (3 by 4 by 30) =360 transactions. According to the M-pesa/Airtel money agent commission rates as you can see in the image, any transaction within the bracket of 101 to 500 attracts a commission rate of 6.4 and 7 respectively. Considering our estimated 360 transaction per month, we find that we will have totals of 180 and 180 transactions for M-Pesa and AirtelMoney respectively. Conclusion, the estimated outcome in the above example will net you an additional monthly agent commission of Ksh.2412. This means you will also have a boost of Ksh.28944 annually. Awesome and easy, isn’t it? Did you know that some of the Mpesa agents and airtelmoney agents never make up to Ksh.5000 each month in their normal mobile money transfer businesses? You can imagine how this gain will impact on your business under such situation. If you are already the M-pesa/airtelMoney agent, you understand what a big boost it will be for your mobile money transfer business with additional 360 transactions each month, resulting to estimated Ksh.28944 additional annual income in terms of agent commission. Remember, I have only explained about depositing cash to the 4 SIM cards 3 times daily. You are probably wondering what will happen when you run out of cash float in your tills. That is likely to happen since I haven’t mentioned anything to do with withdrawing the cash back to the tills. In that regard, you have also started to doubt the method and almost reaching the conclusion that it will be just a shot in the foot. If you understand very well how mobile money transfer networks in Kenya like M-Pesa and Airtel money operate, you already have an idea that it always costs more money to withdraw while deposits are free. Let’s take for example in our case. We started with 20k as total float balance in our M-Pesa and AirtelMoney tills. We expect that after a few days of 110 bob deposits to the 4 phone lines, the float balance will have been exhausted, provided there is no withdrawal transactions made to the tills. Will withdrawing the cash back to the tills be the only option we have in order to complete the cycle? We will have to try that as the last option- meaning that there are better methods that will cost us zero charges that we shall be exploring soon. Let’s do the quick math with reference to the commission expected against the withdrawal charges in case of the 10k bob for each complete cycle. If we decide to withdraw the Ksh.10000 back to the tills, we will be charged Ksh.112 and Ksh.110 withdrawal fee in case of M-pesa and AirtelMoney respectively. In return, we earn Ksh.28 and Ksh.40 as expected estimated commission with M-Pesa and Airtel money respectively on the same transaction. So what do we remain with as our gains in any particular cycle to exhaustion of the Ksh.10000? In 15 days, with a constant of 3 daily deposits of 110 bob to each of the 4 sim lines, the till floats will have been exhausted and that will be considered a full cycle. So, a float recharge will be required every completion of a cycle. Therefore, each month has 2 complete cycles requiring a float recharge each. This outcome means that the withdrawing charges will always eat into our gains and by the end; we will have so little to show for our trick and hard work. Luckily enough, I discovered a trick around this, which will guarantee you full gains- meaning what? You will be able to pocket the whole Ksh.28944 annually in case you just stick to the working parameters in our example. With its unlimited earning potential, this simple method can earn you a lot of cash in case you scale up and work within the transaction ranges of Ksh.1000 plus, attracting higher commission rates gains. Check out STEP 3 for free, to unlock the full potential of this M-Pesa/Airtel Money trick- method. Are you a professional practicing CPA/ACCA or CA accountant/bookkeeper trying to explore online world to earn extra bucks as a freelancer but don’t know where to start from? With the emergence of online cloud-based computer accounting software, many companies in different industries have embarked on outsourcing freelance services online and accounting/bookkeeping services happen to be among those. Based on the advantages resulting from outsourcing services online like cost cutting, accuracy, time-saving etc, the business owners find it profitable to recruit freelancers to perform certain services on behalf of the business at reasonable fees. So, where does this new development leave the accountants and bookkeeping professionals who are new entrants in accounting field? That leaves them only two options; either to evolve and be innovative enough to take a plunge into the newly created online marketplaces and provide their professional services as freelancers- as their own bosses, or completely change their careers in case they are not lucky enough to land one of the few available full-time job opportunities. Even if you are just the aspiring accounting/finance student and worried about your future, let me assure you that you have a bright future in online world once you pass your CPA/ACCA/CA exam, if you can take the right action now and use the little accounting skills you have already mastered in the course of your college study to create your outstanding online working profile. And you don’t need a certificate in accountancy to start with and earn your first bucks online by freelancing. Since you searched and the search engines landed you here, that is already the first step indicating that you understand what you need and you are on the right path and I am here to walk you through all the things you will need to start off on the right footing and put your accounting career to the next level working online in this vast accounting field. That is if you will take some time on this page and read on. Assuming you are a greenhorn in matters online working, online accounting work from home jobs, work through the internet, freelance bookkeeping and all related stuff. We will begin by first understanding what one in pursuit for online accounting career will need to ensure that he actually gets linked to the right potential clients online, successfully bids on available accounting jobs and get awarded the project, which he satisfactorily completes and banks hard. Before we get into the complex stuff of finding the clients looking for accounting services online, you will have to get access to hands on specific tools and equipment required for online bookkeeping to ensure that you will successfully take and satisfactorily complete the client’s work. Probably, you already have most of the items listed. As a freelancer, you will not need to rent an accounting office- just a reasonable space in your house enough to set up your computer equipment will do the job. This happens to be another advantage when working online as a freelancer as it cuts costs and there is no commuting to work every business day of the week. These are the must have computer accounting software for the beginner freelance accountants and bookkeepers and you will be better off with vast knowledge in several of these accounting software, because they will not only boost your chances of winning more client service orders but also give you advantage over your competitors in case the clients request accounting services where only specific accounting software would be applicable- which is not uncommon case in this vast accounting business field. I have listed the above computer accounting software based on their popularity and clients’ priority. Most of them like QuickBooks and sage come with a free trial package of 30 days. I expressly recommend that you at least have 2-4 of the above software installed to avoid missing on the specific order requests since SERVICE ORDERS ARE HARD TO COME BY WHEN STARTING. It is also an added advantage to be an all rounded accounting/bookkeeping expert online if you have extensive knowledge of upto 5 best recommended accounting softwares in the world. It will open more job opportunities online since some accounting professionals usually outsource the services of other freelance accountants regarding the projects which can only be performed using certain specific accounting software they are not familiar with. Out of that, there are professional freelancers out their earning full living online by just offering accounting software coaching services. You can see that I have also included Microsoft Excel accounting on the list. That is not a mistake; Microsoft Excel is a very powerful accounting tool that many are not aware of. With good command in excel accounting skills; you will have edge over other freelance accountants and be able to access endless requests for online accounting jobs under data entry sub-category. OK, our office is now well equipped with all the required tools of trade; computers are all set with the important accounting softwares installed and ready to go. Our next destination will be to locate the clients who are the main backbone of our online accounting business we have just set up. So, where do we find our potential clients searching to outsource accounting services which we are all set to provide? At this point, the most complex stage in setting up the functional profitable business online has just been started. In order to find our first potential clients and get our first service order, we will have to head over to marketplaces where they hang out and try to exhibit our skillset as appropriately as possible. There are many recommended online marketplaces where the freelancers connect with their potential clients seeking to outsource services for their businesses. Here, I will only recommend the three major online market places for beginners to try out and luckily get some orders completed today and get paid. Just head over to each of the above sites through the links provided, sign up (is free to sign up), create your profiles detailing the services you are to provide to your potential clients. You will be all set. Depending on how appealing or unappealing your work profiles appear to your potential clients, you may or may not be able to attract some clients to make order or request job bids- in case of Freelancer. Always bear in mind; the key requirement to succeed in this field of online bookkeeping is not different from other online business professions- creating a client base that will either recommend you to their business partners or reach direct for you when they have a new project. That is to mean- depending on the level of satisfaction your clients get in exchange for your services, they will either make your brand stand out from the crowd or shutter your online career in case they post negative reviews to your profiles. In summary; always aim for SUSTAINABILITY. In fact that is the root for any long term thriving business regardless of whether created online or offline. Would you like to earn some quick $5 extra cash online by simply posting online to public forums as you usually do on social media? In case your answer to the above question is “yes” then sit back and relax as I share with you my two most recommendable online forums that are interesting to join and start earning cash from day one. This is just like getting paid for doing the stuff you usually do on social media networks like face book, Twitter, instagram etc for free. Imagine someone paying you up to $5-$10 daily for all the time you spend online on social media sites without investing anything. This is the best way the beginners working online can easily make some cash completing easy tasks without investment nor the risk of getting scammed. In order to supplement my daily budget, I usually work online on multiple online money making platforms besides my #1 RECOMMENDATION major source of income that brings in passive income. There are numerous forums online that pay to post or rather claim to pay, but not all of them actually stick to their promises. Some turn out to be scams and ban members when they request their hard-earned money payment without valid reasons. Meaning what? Wasted time and efforts for nothing. This is not the case on these forums, unless someone actually violated the terms and rules, especially by copy-pasting stuff from other websites- the offense which is intolerable everywhere. Here is a quick list of the forums I have tried and would recommend without a second thought. I have listed the sites above according to their earning potential and I will be comparing and contrasting them in order to give a clear picture how to get the most out of these forums. The most interesting common feature about the Beermoneyforum and forumcoin is that besides the incentive to earn some extra bucks by creating new unique threads and replying to already created threads, you will also get exposure to very valuable information about different ways of making more money online by other forum members sharing from personal experience point of view since they already worked for them. Both sites have different rules and policies to be observed while working on them as members. Both BMF and FC forums have their own different kinds of currency coins valued @ $1 per 1000 and $1 per 100 coins/points respectively. Their currencies are BMFs and FCs respectively and they can be redeemed for PayPal cash or can be used on either of the forums to transact on their marketplaces. The screenshot below details everything about posting and limits on BMF forum and will give you a hint of what to expect over there. As indicated in the image above; in order to redeem the earned coins, one has to reach the minimum of 5000 coins to request a payout equal to $5 dollars, where the payment will be sent on 25th through PayPal. There are certain posting limits to adhere to in both forums. On Forumcoin, the members can only earn FCs on their 10 first posts in 24 hours. As for the case of BeerMoneyForum.com, the users are able to earn redeemable BMF coins on 5 posts within the same hour. So, after reaching the hourly post limit, one has to wait and post in the next hour. Otherwise, there is no limit about how many posts one can post in a day like in the case of forumcoin. The post limitation in both cases doesn’t mean that one can’t be able to post upon reaching the maximum posting limit. One can still post as many times as he wishes, but the posts won’t earn any coins. This usually enhances engagement on the posts interactions among the members interested in finding out more info regarding a certain interesting thread. I recommend that you join both forums here in order to take advantage of the important info in topics discussed on both BMF and FC besides earn some cash for a bottle of beer. Indeed that is the only possible way you will collect more coins. The topics discussed on these forums will be the eye-opener to even better earning online sources by just following the step-by-step guides shared by the success members in those areas. The presence of the referral system offers an additional way to earn more when the members refer other members through the available referral link. There is a $1 dollar sign up bonus in case you SIGN UP HERE for BMF and HERE for FC as my referral, otherwise you will miss that bonus by signing up on your own, directly. As you can see, the amount of money that you can be able earn posting on these forums is only able to buy you a bottle of beer. So, in case you are looking for ways to earn big online, I recommend checking out my #1 RECOMMENDATION besides the learning HERE THE SECRET MARKETING METHODS that makes it possible to achieve my dream of earning around $20 daily as passive income. To clarify something, it will likely look impossible to earn anything from my #1 RECOMMENDATION without implementing the tricks and hacks only accessible through the link above. I understand how hard it is nowadays to get your application approved to work at Humanatic reviewing recorded calls, but also none of the honest call reviewers is safe anymore. You want to find out why? Keep reading. I see them all over the web especially on make money online forums asking, "how to apply and get accepted on humanatic?" Sit tight, I have good news for you. No doubt, humanatic is legit and is a unique way many people around the world have been earning income close to 10 years now just sorting out recorded calls to their respective categories based on the instructions in the calls overview. So, in case you had any doubts as to whether humanatic is a scam, then you just got the positive opinion from a veteran humanatic user and below is my humanatic proof of payment. I have been there for several years. Earned enough extra cash from reviewing recorded calls and it is awesome experience especially as a beginner in the work online stuff. It also feels great when my name is featured on the leaderboard amongst the top earners as indicated in the screenshot below. While I can testify that humanatic is legit online work platform suited for work from home mums, dads and students with a handsome pay perks, I can no longer recommend it to anyone anymore. This is my stand because I came to realize that that is slave labour, especially nowadays since humanatic is highly infested by the cheaters who are making more cash by tagging incorrectly while the honest reviewers are getting their accounts deactivated if not frozen. The worst part of it is that humanatic has the worst support contact service I have ever experienced in the whole internet web. What do I mean? I mean that if you ever run into a problem while working as a humanatic calls reviewer, there is no way your issue will be addressed since those guys never respond to support e-mails. Initially, they used to have a forum where the reviewers would get some of their issues addressed by the other community members, especially the superhumans were very helpful when it came to confusions in tagging certain calls. The only remaining semi-functional form of contact available to humanatic reviewers is the face book page. Semi-functional in the sense that; while the members can interact, they can only respond to each other with comments and replies on the latest page updates by the page mods- who no longer care what the members discuss. Anyway, even while the forum was around, still there was a lot of trouble communicating with the admins in case the issue wouldn’t be handled fully by the forum mods. The most dangerous thing I came to discover about humanatic is that; after testing the waters and considering that it would be a reliable source of income online working from home, some reviewers get convinced to quit their 9.00 to 5.00 job and choose to review calls full time. Yes, you will get the bills paid. You will earn higher than standard recommended minimum wage provided there are calls available. But the fear of uncertainty is something you have to live with. It is now a fact that; with the influx of more cheaters than honest reviewers -who seem to have taken over the control of the system and rendered everyone hostage, no honest reviewer is safe especially in the hands of the rogue mediators who approve the incorrect cheaters’ calls tags. It means that the probability of getting your account deactivated is almost 1 in case you face any audited calls as the result of deliberate incorrect calls tagging by the cheaters approved by the rogue mediators eyeing to earn faster. Remember, there is no difference whether you are banned by mistake or as a real cheater, because there is no way you will reach out to support to get yourself vindicated. This is not a warning about humanatic turning a scam in the near future, but just the reality at hand to stay prepared in case the worst happens, else you will be sorry. SO WHAT CAN YOU DO TO AVOID THIS FEAR? Out of the fear of uncertainty explained above about working fulltime on humanatic, I have done a thorough research on the internet. I believe to have tried everything that looked greenish. Wadded through the online murky waters but eventually emerged from the other end of the tunnel with SOMETHING TO SMILE ABOUT. But before that, I was also a great fan of bitlanders, and to some extent, I was convinced that bitlanders was either a match or a better alternative to humanatic. I was wrong. I am now convinced that I have discovered a reliable online income generating alternative better than humanatic, with residual income stream worth a look. Unlike when I was fully relying on humanatic, where one can only earn when actively reviewing calls. Now I earn passive income while asleep. Check out the payment proof from my new income stream I now recommend to everyone looking for long term online income stream to join. So, humanatic rejects out there, what are you waiting for. Get on board and hopefully you will be earning your firsr few dollars if you are a quick learner. I am excited to see that I just taught you something new today. But this is just the beginning. So, it is up to you to JOIN HERE and FIND OUT HERE the tricks I am employing to make this a reality. You can decide to join now and take a closer look later, else you can as well skip, but that means you won't have free access to any of my crazy hacks, tutorials and blackhat methods I discovered on my own that are making it to happen. I am ready to assist whoever can give back a little, and this can simple be achieved in case you SIGN UP HERE as my referral and I will be your personal coach for free. we both benefit symbiotically. Nobody loves parasites. Is there? Go ahead and sign up through the link provided and take a look at my protected content to find out more info. I can't guarantee you anything, but you can be able to earn your first $$ today by simply following some of my hacks you can only ACCESS HERE after verifying that you are human. Did you know you can withdraw online cash in PayPal account through Safaricom M-Pesa mobile transfer service in Kenya without paying anything? Until recently, Equity bank account was the only way though which the Kenyans making money online or carrying out business online or shopping online would access PayPal services and be able to transact worldwide through the internet web. Equity bank account was also the only way Kenyans would verify their PayPal accounts in order to lift the PayPal withdrawal limit. Initially, it would take a long wait of up to 8 business days of waiting for the transactions to complete when one transferred cash from PayPal to his local Equity bank account in Kenya. The waiting period was later cut to 3 business days when the Equity bank reviewed their partnership contract and it was another major breakthrough which attracted a big celebration by the Kenyans working online and getting paid income through PayPal. To date, that is the waiting period for the Equity customers transacting with PayPal. Not long ago, Safaricom through MPesa mobile transfer service introduced Mpesa-PayPal money transfer service which came along with some benefits that were not available with paypal-equity money transfer service but at a high commission percentage rate per transaction. In fact it is double the commission charges offered by Equity. While Equity charges 1.5% commission on total amount transferred, Safaricom came with 3% commission charges. 1. The transactions are faster and the customers are able to access their online money in paypal account through their mpesa accounts on mobile phones within 2 hours of initiating the transaction, as long as they have initially linked their mobile phone number with the e-mail address associated with their paypal account. 2. The amount indicated in the transaction online is the exact amount that is received in the M-Pesa mobile account. No hidden charges at all. After the Safaricom lauched the PayPal Mpesa money transfer service, I was excited to check how convenient it was as compared to the similar service we were used to by Equity bank. The first thing to check was the charges associated to each transfer transaction and I was disappointed finding out that they charged double the transaction commission offered by Equity bank PayPal money transfer service. I had made up my mind to stay with Equity bank service since the waiting period of 3 days was not an issue and I was used to accessing my cash either by using the Equity bank VISA ATM card or the Equity agent outlets. The issue was to be charged double the amount of commission I was used to, just like that. I was for the idea that I would only opt for the Safaricom Mpesa –PayPal transfer option when I urgently needed access to the money in my PayPal account. The fact that I am the M-Pesa agent who is also selling Kenya Power tokens through JazaPay changed everything and I now discovered how one can withdraw PayPal money through M-Pesa in Kenya without being charged. This is after comparing the charges I faced from the point of withdrawal from PayPal through Equity Kenya bank account until it finally landed as hard cash in my pocket. Instead of my online cash going though the usual channels, I decided that I would be withdrawing the online cash in my PayPal account through M-Pesa. Upon reaching my mobile M-Pesa account, I can either buy the JazaPay KPLC token float and sell tokens direct to my customers, thus converting it into hard cash while at the same time making some profit on KPLC token sales. I can also use the same amount of cash received as M-Pesa agent float balance and conveniently make direct transfers on behalf of M-Pesa customers who happen to lack phones or don’t know how to use M-Pesa to send money to their relatives far away, as long as they pay the transfer charges. No need to deposit cash to my personal phone number to send out. I am now saving more than I ever imagined and I feel good that Safaricom Mpesa PayPal money transfer service is working in my favour as M-Pesa and Jazapay agent as well as a work from home online freelancer in Kenya. You wonder what I do to earn consistent income online from home through the internet in Kenya? While many Kenyans are more than frustrated by the way the Kenya Power tokens system actually works in billing the prepaid electricity meter users, there are many rogue and fraudulent Kenya power employees on the prowl who are taking the advantage of their offices and fleecing the Kenyans who like backdoor privileges. When the Kenya power announced the discontinuation of the monthly fixed cost charge, many electricity subscribers celebrated- unknowingly that it was just the government ploy to shift the burden from the right-hand-side to the left and to try end the power billing scandal. In other words, only the name MONTHLY FIXED COST was removed, but not the numbers. For example; the last time I bought the electricity power token was on 25/09/2018. I was given 22 Kwh units for Ksh.500- the same amount on cash that would get me over 40 Kwh units before when I bought the token within the same month I already got charged the monthly fixed cost of 150. Even the Kenya power online customer care reps failed to convince how they actually calculate the token units. For those who thought that the removal of the monthly fixed cost on electricity would reduce the cost of monthly electric bills by Ksh. 150- the amount that would be compounded to a good annual savings of up to KSH.1800. But is this the reality on the ground? No. As it stands now, it seems like the small scale electricity users in Kenya are the most adversely affected with the new token billing system as if it is the secret the Jubilee government of using to ride on the shoulders of the mama mbogas to enhance the industrial development and their BIG 4 AGENDA- where the large scale electricity users especially the industries are boosted by paying less per KWH unit of electric power. Someone suggested that one has to understand the best time to buy KPLC tokens on mobile or online. How that works, I have no idea. It is alleged that KPLC tokens prices fluctuate from time to time. KPLC, just like the mobile operator companies in Kenya, takes the advantage of the peoples' illiteracy knowing that the users who don't even know how to load KPLC tokens will not search for Kenya Power contacts to ask questions. All they would need is KPLC token pay bill number. Far from that, there are illegal direct power connections initially engineered by the rogue Kenya power technicians at a cost (supposedly a one-time payment) that would guarantee the user access to free power for a lifetime. It is alleged that the Kenya power technicians are the one who initiates such deals, promising to cover the culprit and give assurance that nothing would go wrong. There are a few friends I know who have fell for this kind of fraud. They always said that the deal was so good and it would be kept as a secret no one would care much about. In one such case, the things blew when the contact technician who initiated the direct illegal power connection was transferred to another location of duty. Whether the corrupt deal was revealed by the contact rogue technician to the one in charge of the location or not, it down on the attention of my friend that the illegal power connection wasn’t a secret anymore, and the Kenya Power technician in charge of the area was demanding a hefty pay to suppress the matter or else report to the relevant authorities where it would attract the penalty/fine of over KSH.1 million cash besides the permanent power disconnection. It is funny to note that; my friend who is just a threatened caretaker was forced to part with KSH.10000 where a certain share of which was to be paid to the initial Kenya power contact who assured him nothing would go wrong with the direct power connection deal. Who is laughing now? My friend’s plea to get the direct power connection cut because things are no longer the way it was supposed to be hasn’t got any attention. In fact, they have threatened to blow things up in case he gets the illegal power connection disconnected, and claim to have already gathered enough evidence to get him behind bars for vandalism and tempering with the Kenya power company property. So, the reality with those Kenya power guys is that; they convince you to accept their corrupt deal of getting access to a life time free electric power at a little fee. When they get you on their hook, you become their gold mine and you will have to dance to their tune since they actually know there is nothing you can do to get off the hook that easily. Remember, they will expose you to miserable life counting on the fact that you won’t stand a chance against them in any court of law in case they report the matter for failure to comply. The corrupt illegal connection deal is initiated by the Kenya Power technicians. At least you will have that, but how will the culprit prove that before the court of law during the judgment. As it stands now, the freedom of my friends hangs on the balance of complying with the Kenya power blackmailers and an inevitable imprisonment in case they decide to report the issue. As the government of Kenya claims to be on the right track towards combating corruption in the nation, is it aware of such sophisticated corrupt deals happening every other day? You probably landed on this page while searching info online with view to find out whether usercrowd.com is a scam or not. Right? Another possible reason that might have led you to this usercrowd review post is likely the search for some reliable alternative ways to earn some extra income online besides usercrowd for testers. Whatever reason, I am sure you will get all your questions answered to satisfaction. Stay around. Learn from the person sharing personal experience as a veteran usabilityhub website tester. I decided to write this Usercrowd for testers honest review based on my personal experience so that other users, who are my readers can join with an upper hand about what to expect to gain in there. What is Usercrowd for testers? Formerly UsabilityHub.com, recently rebranded to Usercrowd.com; is a website and app that brings the web designers and testers together with mutual benefits. While it offers the testers the opportunity to earn by participating in user-testing the tests as they become available and give reliable feedback, it is based on the feedback given, upon which the designers are able to understand if their products under review meet the standard they are looking to accomplish and would know which areas to improve if any. Working as a design tester on Usercrowd, one will participate in the tests on the basis of their being available online when the tests become available accessed on the dashboard. This means that in case you have limited time on the internet, you will miss the tests most of the time and result in earning little online. invalid submission notification upon submitting the test-which means lost earnings. How much can one earn as a usertester on Usercrowd? Are you signing up as a usercrowd tester expecting to make a lot of money? If your answer is yes, then you are in for a big disappointment when you realize that you can't actually make more money working as a design tester online. The users are credited 10 cents ($0.1 USD) for every successful test submitted. That was then, now they claim to have introduced longer tests that will earn higher credits depending on the length of time allowed. How does Usercrowd pay the testers? Usercrowd make payout to the design testers through PayPal as the only payment processor available. The payments are requested when one earns a minimum of $10 USD- formerly it was $20 USD. The payments are received 2 weeks later. This means that one has to sign up with the e-mail address associated with a verified PayPal account. Who is eligible to join Usercrowd? Anybody wishing to earn extra shilling online can participate as a designer tester, and is open to users from any country across the world. All are welcome to sign up and start participating in available tests right away and earn. No special approval needed. One can sign up using the Face Book too. There is no learning curve since the earning rate is determined by the availability of test surveys. Is usercrowd.com a scam or not? Back to where we started from. As to whether Usercrowd is a scam or not, I can evidently say it is not a scam site and I can recommend anyone searching for ways to earn extra shilling online to sign up here and begin participating. I have been a member for several years as a tester and got paid severally without issues. I have a proof of payment attached below. It has been in existence for long and I have every reason to believe it will remain a legit site for many years to come. As much as I know, no scam site can continue using the services of PayPal for such long period of time without getting their accounts suspended. If you take time to check a handful of the honest usabilityhub reviews online you will likely find that the complaints are about low credits and delayed payout. Is there any alternative to Usercrowd.com that will enable the users earn much faster online? Yes, if you are the ACTION TAKER looking for serious ways to earn more fast cash online without investing any money, I can assure you there are many ways you can do that, but instead of listing all of them here, I find it more helpful introducing you to only training course program that you will need to unlock the doors to proven earning ways online if you will put in some efforts and dedication, learn at your own pace as you build your online business from scratch, and there is no risk.